Here are some facts about how horses were used in WW1. At the start of World War 1 horses were mainly used in cavalry units. However, as the war progressed, it became clear that horses were incredibly vulnerable to machine guns and artillery fire. The days of the cavalry charge were over! On the Western Front, cavalry forces weren’t used extensively for very long after the fighting started, but they were used for longer on the Eastern Front. The armies of the Ottoman Empire included cavalry throughout the war, as did the British Army, particularly in the Middle East. Horses were more commonly used for logistical support – they were able to move well through mud and rough ground to carry messages, pull supply wagons, and move medical staff and the wounded and artillery. As the war went on, horses became more and more difficult to replace. Their value, from a purely economic and strategic stand point, outweighed the value of a soldier. The conditions faced by the horses used in World War 1 were very harsh. Many died of starvation, disease and exhaustion and many othersdied as a result of artillery fire. In order to satisfy the need for horses, Britain purchased horses from Australia, Argentina, the US and Canada. They were also bought from British citizens. In one day during the Battle of Verdun more than 7000 horses were killed. Over 1 million horses and mules were used by the British Army during World War 1. More than 400,000 of them were killed. At the end of the war, many horses were put down because they were ill or too old. Many healthy horses were sold to slaughterhouses or to the local population. Due to quarantine restrictions, horses shipped from Australia during the war couldn’t be returned. Of the 130000 horses, only 1, a horse called Sandy, returned. 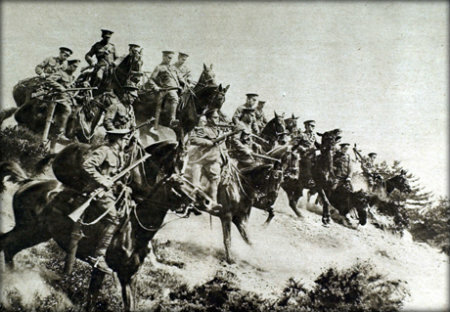 After World War 1, the use of horses in war became less widespread. Tanks replaced cavalry. Alfred Munnings, a war artist, working in France in 1918, produced many drawings and paintings featuring the role of horses in the conflict. Michael Morpurgo wrote about a cavalry horse in World War 1 in his 1982 book War Horse. It has since been adapted for the screen and stage.